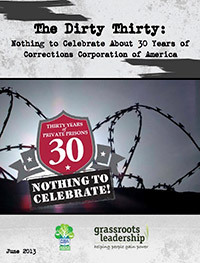 In honor of Corrections Corporation of America's thirtieth anniversary, Grassroots Leadership and the Public Safety and Justice Campaign hava released a new report "CCA's Dirty Thirty: Thirty Years of Nothing to Celebrate about Private Prisons." Along with examples of violence, deaths, lawsuits, scandals, and lobbying, three Texas stories made the list: the beginnings of CCA and the modern for-profit prison industry in Houston, sexual abuse at the T. Don Hutto Detention Center, and the tragic conditions at the Dawson State Jail. Auspicious Beginnings: "Just Like Selling Hamburgers," CCA Opens First Detention Center in Houston, TX: In 1983, CCA won a its first contract with Immigration and Naturalization Service (now Immigration and Customs Enforcement) and converted an old hotel into the Houston Processing Center. According to co-founder Tom Beasley, the company was founded on the principle that you could sell prisons “just like you were selling cars, or real estate, or hamburgers.” Another co-founder, T. Don Hutto -- who would eventually lend his name to an infamous family detention center -- was the only one with corrections experience, from his tenure as head of the Arkansas Department of Corrections where the Supreme Court ruled horrific conditions were pervasive. Family Detention and Sexual Abuse at Hutto: From 2006 to 2009, the T. Don Hutto Detention Center was contracted by ICE to hold immigrant families. Children detained with their mothers were forced into prison-like conditions that clearly violated their rights as outlined in a 1997 settlement, leading to a lawsuit filed by the ACLU on the childrens' behalf. While the Obama administration ended family detention in 2009, it stopped short of closing Hutto altogether and instead began using it to hold women seeking asylum. In the following years, multiple allegations of sexual assault by guards on detained women emerged. As a result, Hutto has been the subject of two federal investigations and a class-action lawsuit filed by the ACLU. "No baby should be born in a toilet in prison": Indifference Leads to Death at Dawson State Jail in Texas: Before the Texas Department of Justice caved to pressure to close the facility, poor medical care allegedly led to the premature deaths of several women and an infant. Shebaa Green and Ashleigh Shae Parks both passed away from pneumonia, while Pam Weatherby's untreated diabetes eventually took her life. Most tragically, the newborn girl of a woman who was refused a pregnancy test and prenatal care died after being born into a prison toilet while no medical personel were present. CCA is facing suits from the deceaseds' families, as well as s the Texas Civil Rights Project for refusing to release information about medical care and deaths at the prison and by Prison Legal News for "unconscionable and unconstitutional conditions" at the prison. Along with also CCA-run Mineral Wells Pre-Parole Transfer Facility, Dawson State Jail will close on August 31. "Several more people were sentenced in connection with a federal lockup bribery scandal in which jail employees were accused of giving inmates banned goods in exchange for cash. In total, eight of the accused jailers from the Community Education Center received federal prison time as well as three years supervised release after their federal sentences. One jailer received probation." The facility has previously made TPB write-ups for cell-phone smuggling that lead to indictments in 2008 and the suicide of Luis Chavez-Chavez, an immigrant prisoner being held on illegal entry charges, that same year. As we reported in April, GEO Group has finalized the purchase of the Joe Corley Detention Center from Montgomery County and is looking to expand that purchase to include the Montgomery County Mental Health Treatment Facility, both of which were operated by the company but owned by the country. Originally built to house a population that never fully materialized, the Joe Corley Detention Center has been a financial headache for the county, which will use the $65 million raised from selling the facility to assuage its debt. Given GEO Group's track record with mental health treatment, the possibility of the company purchasing MCMHTF is jarring. Even more frightening are GEO's plans to build a second federal prison in Conroe -- with the full support of the county commissioner court. The sale of MCMHTF and construction of a new prison aren't final yet. We'll continue to update as news developments arise. On Satuday, seventy community members from Austin and Houston rallied outside the IAH Secure Adult Detention Center in Polk County to advocate for an end to immigrant detention. Run by Community Education Centers, the Polk County Detention Center was highlighted as one of the ten worst in the nation by Detention Watch Network's Expose and Close campaign and has been the subject of an ongoing campaign by Grassroots Leadership and Texans United for Families. The vigil was the second of its kind, following a similar action in December. I commend you for your efforts in highlighting the mistreatment in some detention centers and support you in your campaign to expose the truth and bring justice to this situation. Chanting "Close Polk now" and "Si se puede," the activists pledged to continue the campaign until the facility is closed. It's safe to say that this hasn't been a particularly good 12 months for private prison corporations in Texas. Harris County rejected a proposal privatizing its jail system last year. The Texas legislature has ordered the Texas Department of Criminal Justice to close two private prisons in its recently concluded legislative session. And counties are reconsidering their relationships with private prison corporations - Liberty County is debating de-privatizing in an effort to save money, McLennan County and Limestone County are both looking for new operators after private prison corporation Community Education Centers failed to bring in or maintain federal contracts. "As has been identified in numerous studies, reducing the salaries and benefits of detention officers results in increased turnover, a decrease in qualified applicants and substandard performance. Quality of service is significantly reduced. Reducing staffing levels results in the same problems." RFP bids are due July 1st. We will keep you posted on developments from Ellis County.